Proper trimming is important for tree health! If you take care of bonsai trees for a hobby, then you understand that there is a right way to trim a tree, and a wrong way to do it. Now you might think that tree trimming involves the artful placement of lights and ornaments, but even if you are always in a holiday state of mind, these pointers for proper tree trimming can be a huge help. Trimming a tree isn’t like a hasty haircut you can perform on your tree. No, you have to prune it carefully. After all, a haircut can turn out poorly if it isn’t done with the due amount of skill and precision. Find where any dead wood on your tree still lingers. That should be your priority – removing dead wood. 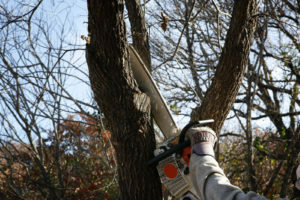 Smaller branches are also safe to remove, provided they aren’t attached to a larger limb that the tree actually needs. Many tree owners will end up hurting their tree and not even realize it. However, if you don’t do a good job of trimming your tree, you could make it sick or even cause it to wither and die before its time. Tree limbs and branches are just as complicated as the limbs, toes, and fingers on your body and your bloodstream – where nutrients go, growth follows. Ultimately, you will most likely need expert assistance. In that case, don’t hesitate to call Nelson Tree Specialist. Our experts will ensure your trees remain happy and healthy for as long as possible, no matter their shape or size. Tree care is our passion, and we won’t let you down. We can help you determine what each tree around your home will need in order to thrive. Once spring returns, your tree will be in full bloom, all thanks to your dedication and proactive efforts. This entry was posted on Friday, January 5th, 2018 at 1:43 pm. Both comments and pings are currently closed.